Mother moose, trying to scare me away. One late afternoon, we had a visitor in our backyard, atop a crabapple tree in full bloom. It was a Great-Horned Owl, a native of our Rocky Mountain region. Then, we found the owl's nest in a nearby open-space area. Can you see the little yellowish fur-ball at the foot of the owl? The yellowish fur-ball turned out to be babies. 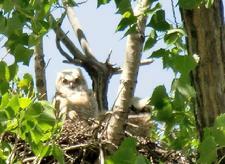 Several week later, two baby owls showed themselves. One morning, we found a Bald Eagle atop a tree in the open space. Bald Eagle is the National Bird of the USA. Awesome! Another morning, we heard a knocking in the yard. It was a woodpecker. No, it's not a dog. It's a Coyote walking on frozen pond. September hike in Ruby Creek near Winter Park, Colorado. Great season for hiking and enjoying the nature. The peak of Ruby Creek in the backgound is 11,760 feet. The path to Flatiron Mountain in Boulder, Colorado. December 2009. This winter, we are experiencing much snowfall in the Rocky mountain region of Colorado. The first big snow storm arrived in late October, followed by a few more in November and December. The East Face of Longs Peak (14,255 ft/4,320m) in the center, in the Rocky Mountain National Park in Colorado. Arapahoe Pass in the Indian Peaks area. Arapahoe Pass is at 11906ft/3610m. Arapahoe Pass to Caribou Pass (11,852ft / 3,590m). The Continental Divide of the Rocky Mountain between Arapahoe Pass and Caribou Pass. A continental divide is drainage divide where any rain water or meltng snow water flows down one side to the East and the other side to the West. August 2009. Lake Dorothy (12,061ft / 3655m) near the Arapahoe Pass. Flatirons, a part of the front range just west of the city of Boulder, Colorado. October 2008. Leaves turn bright orange in October. View of the Colorado Rocky Mountains, from Green Mountain in Boulder. October 2008. Y. Usui atop Green Mountain in Boulder, CO at 8,200 ft.
Did you know that there is a glacier in Colorado? This is a picture of St. Mary's Glacier at 11,000 ft.